It’s been a bit busy around here the last 22 months or so and even longer if you include the 3.5 months I was in Atlanta in 2011 dealing with real estate issues. I’m happy to say that I made a few major changes recently, chief of which was quitting my part-time job and I am now ready to move on to other things. Pet petting was on yesterday’s to-do list. Okay, maybe it wasn’t on the list, but when the opportunity presented I thought, I really want to pet that Ginger pig on the nose and I’m not going to let that electric fence stop me! I’d never seen Ginger pigs before and it seems Tamworths, as they are actually known, have an interesting history. 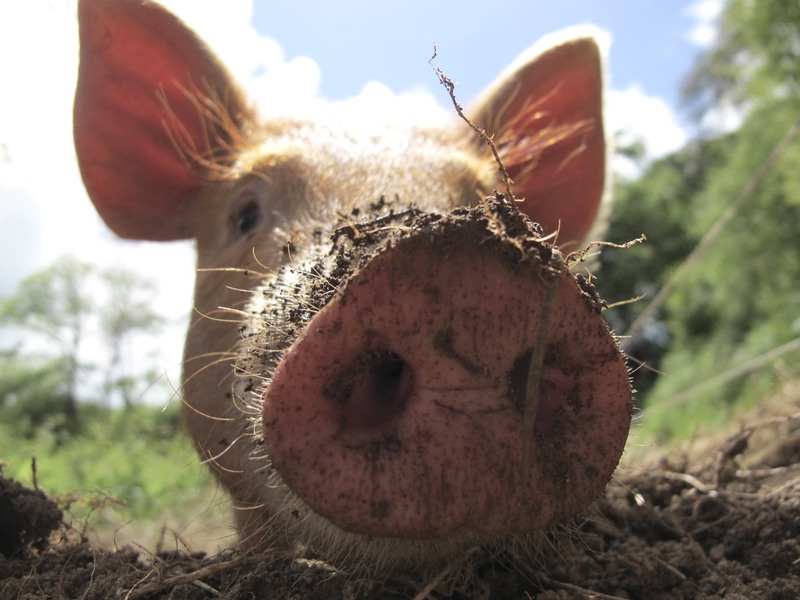 This delightfully written website will answer loads of questions about the breed and tell you much more than I could about these friendly pigs. I can say that giving these little ones a couple of pats and ear scratches may well have put me off bacon. 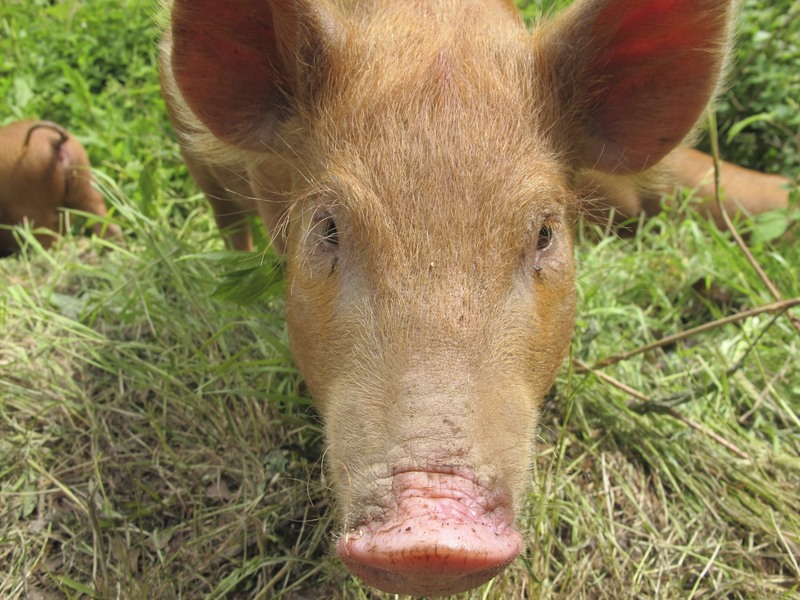 Who knew that some pigs had such long eyebrows and eyelashes. That’s going to put me off sausage too. 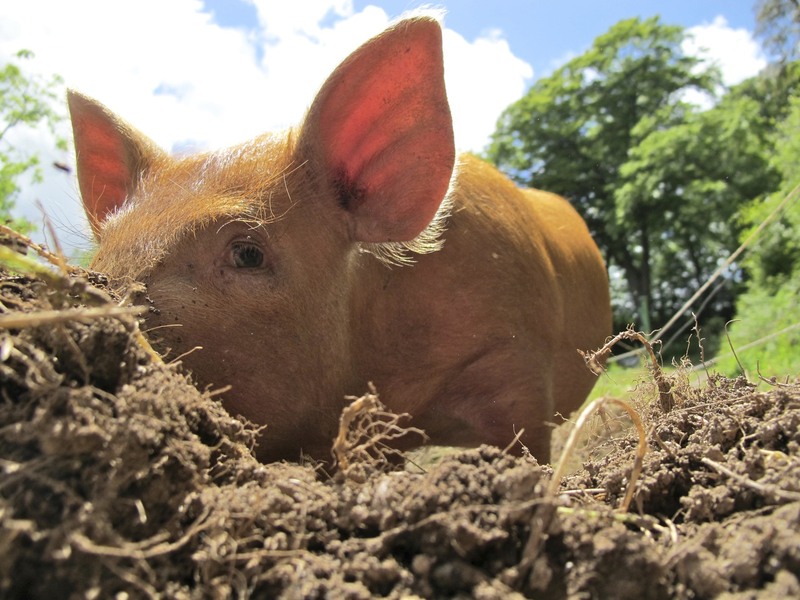 This entry was posted in Adventure, Living in UK, Photography, Work and tagged Animal Photography, Cornwall, Elizabeth Harper, Gifts Of The Journey, Ginger Pigs, Liz Shankland, Pigs, Tamworths, WWII Pigs In Britain. Bookmark the permalink. I WUV DEMS! I am so jealous of you right now. I am also eating a BLT. Life is full of ironies. I’m with you….I just ate my last sausage. They have these cuties in the Attingham Park walled garden. They are there to churn the ground and make it suitable for planting vegetables! I especially love the last shot of his nose in the dirt. So cute! What a beautiful breed and an interesting read about them. The sow in the photo reminded me of Wilbur the pig in Charlotte’s Web. Thanks for sharing! The irony with pigs is that they don’t really have any other function than meat, so if we stop eating them, these breeds would die out except a few kept as curiosities. 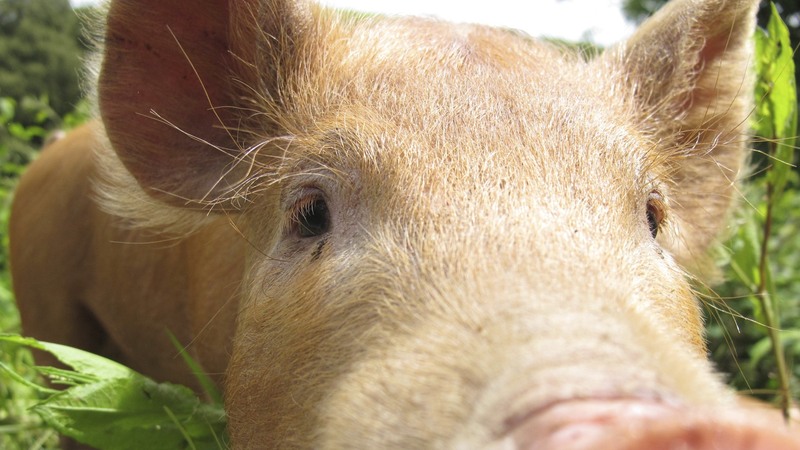 In fact, eating rare breed pork helps keep them going, rather than just buying mass farmed bacon from the supermarket. So the more we want to see Tamworths and other interesting old breeds, the more we have to eat them! Haha, that last one with the nose, lovely. Looking forward to hearing about your post-part time job activities. Well don’t get up and personal with a cow then, Their eyes are beautiful! This year I had 2 firsts. I pet a mini pig and held a 4 foot long “therapy” python! I asked the owner of the mini pig (she is going to raise them) if this put her off pork and she said no! There is a Cornish saying that the only bit of the pig you can’t eat is the squeal The way to weight a pig? Put a board across a hedge with the pig one end and a heavy stone the other. When they balance, guess the weight of the stone! Only Cornish humour! Thank you so much for the kind reference to my website http://www.biggingerpigs.com ! I hope you enjoy rearing your Tamworths – I know you will. To those who made the bacon sandwich jokes, etc, above – yes, they DO taste great. Best pigs for both pork and bacon. And we DO need to keep on eating them to keep the breed alive. Not all pigs born in a litter are good enough to breed from, so we eat them. We only breed from the best, in order to keep the breed standard as it should be. 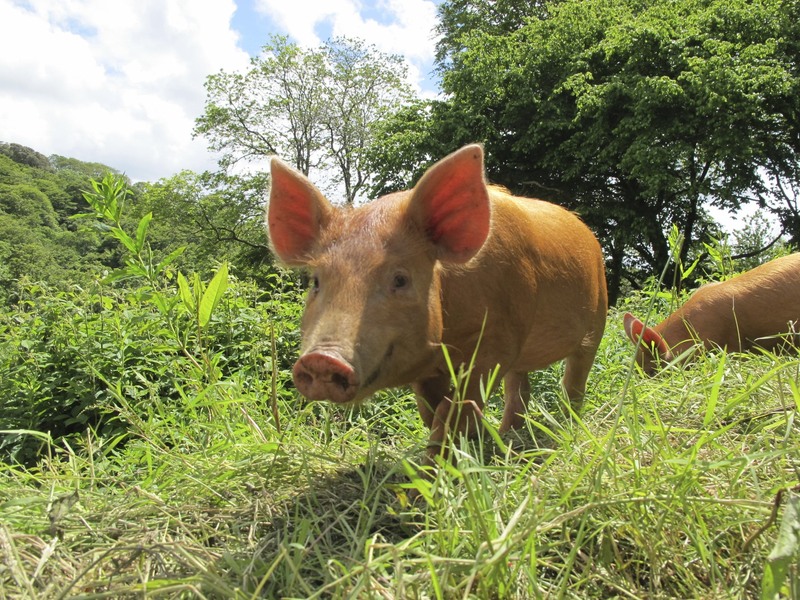 So….don’t feel guilty about having a bacon or sausage bap – you’re doing your bit for conservation! I am sure I am not imagining it….the piggy in the second photograph is smiling. They are sweet looking pigs. I will continue to do my part in keeping more varieties of pigs in existence by having the occasional meal with pork. It will be hard not to think of that little piggy’s smile, though.